None can deny that it is with no doubt a positive turning point for the Nigerian Economy and Young business owners at large. 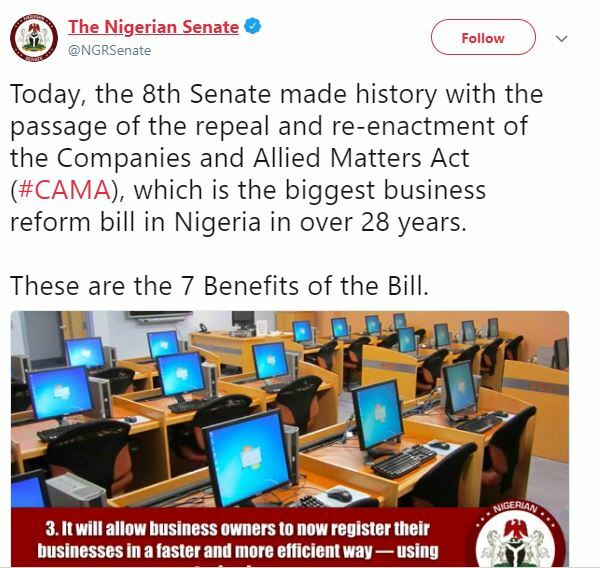 The senate shared the benefits of the bill on their social media pages and it includes, making Nigeria’s business environment as competitive as its counterparts around the world. This will allow individuals to be able to start businesses by themselves, as well as promote the use of technology to registration of their business. CAMA removes all the unnecessary regulatory provisions for small companies. And lastly, it ensures that Nigerians can now register their businesses from anywhere in the country through the e-registration system that the senate’s amendment gives legal backing. The senate president further stated on his twitter page that; “Today is a significant milestone in our legislative agenda. The passage of CAMA which is by far the biggest and one of the most far reaching legislations ever passed in any legislature in our country. Now start-ups can register and run a business in an easier and more efficient way. Kudos to the Nigerian Government for this!